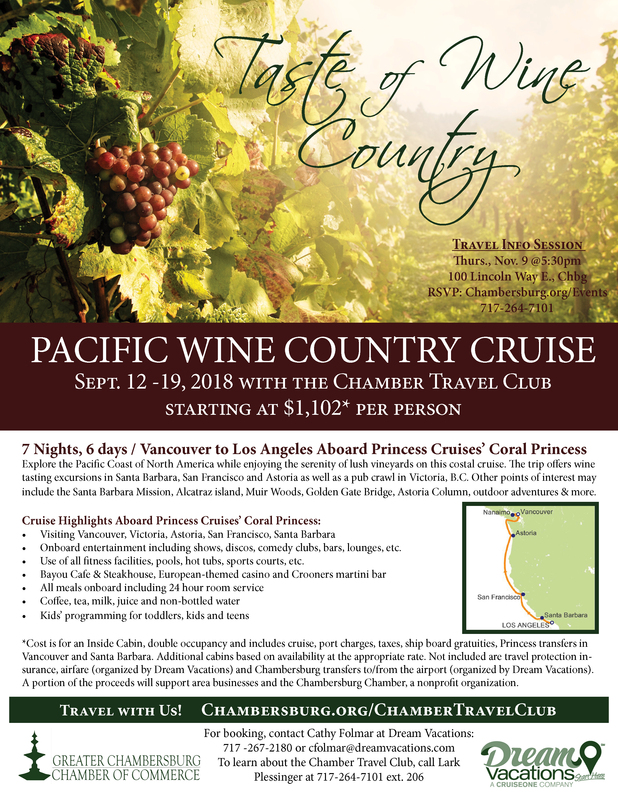 Explore the Pacific Coast of North America while enjoying the serenity of lush vineyards on this costal cruise with the Chamber Travel Club. The trip offers wine tasting excursions in Santa Barbara, San Francisco and Astoria as well as a pub crawl in Victoria, B.C. Other points of interest may include the Santa Barbara Mission, Alcatraz Island, Muir Woods, Golden Gate Bridge, Astoria Column, outdoor adventures and so much more. Use of all fitness facilities, pools, hot tubs, sports courts, etc. Trip organized by Chamber Member, Dream Vacations, with a portion of the proceeds supporting the Chambersburg Chamber, a nonprofit organization. *Cost is for an Inside Cabin, double occupancy and includes cruise, port charges, taxes, ship board gratuities, Princess transfers in Vancouver and Santa Barbara. Additional cabins based on availability at the appropriate rate. Not included are travel protection insurance, airfare (organized by Dream Vacations) and Chambersburg transfers to/from the airport (organized by Dream Vacations).